Dr Sujana Adapa is a Senior Lecturer in Management (Strategy & Marketing) in the UNE Business School at the University of New England. Sujana principally teaches marketing related units such as Introduction to Marketing, Services Marketing, Strategic Marketing and Consumer Behaviour. Sujana’s research areas include small and medium sized regional firms, corporate social responsibility, innovation adoption, destination branding and cross-cultural consumer behaviour. She has attracted small research grants from the Institute for Public Accountants and the UNE Business School to investigate various marketing and management issues within the small and medium sized regional accounting firms. 2015 – outstanding unit and teaching evaluations for coordinating MM110 Introduction to Marketing and MM311 Consumer Behaviour units in Trimester 1 for undergraduate students. 2015 - LearnX Platinum Award (Asia Pacific region) for Best Online Teaching Facilitation. 2014 - LearnX Platinum Award (Asia Pacific region) for Best Online Teaching Facilitation. 2014 - UNE Award for Outstanding Achievement Innovation and Excellence in Teaching. 2014 - outstanding unit and teaching evaluations for coordinating MM311 Consumer Behaviour unit in Trimester 1, MM314 Services Marketing and MM316 Strategic Marketing in Trimester 2 for undergraduate students. 2013 - outstanding unit and teaching evaluations for coordinating MM311 Consumer Behaviour unit and team teaching MM110 Introduction to Marketing units in Trimester 1, MM314 Services Marketing and MM316 Strategic Marketing units in Trimester 2 for undergraduate students. 2012 - UNE Business School Award for Excellence in Teaching and Learning ‘for developing assessment strategies that encourages off-campus students’ independent learning’. 2012 - outstanding unit and teaching evaluations for coordinating MM314 Services Marketing and MM316 Marketing Strategy and Management units for undergraduate students in Trimester 2. 2011 - outstanding unit and teaching evaluations for coordinating PDAS 311 Globalisation, Social Issues and Public Policy, MM316 Marketing Strategy and Management unit in Semester 2 and GSB736 International Marketing unit in Reporting Period 3 for MBA students. 2010 - outstanding unit and teaching evaluations for coordinating GSB737 Services Marketing unit in Reporting Period 2 for MBA students. Sujana’s research interest is in exploring cross-cultural consumer behaviour, service delivery channel management, international market entry strategies, corporate social responsibility, career progression of women and small and medium sized enterprises. 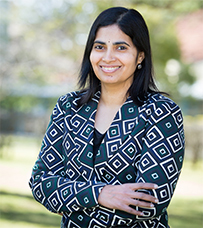 Sujana’s current research projects relate to exploring career progression of women in small and medium sized regional and metropolitan accounting firms and corporate social responsibility practices in small and medium sized accounting firms in Australia, Malaysia and India. Project 1: ‘Peer to peer learning (Business)’ (Ms Nola Holmes & Dr Sujana Adapa) – secured $33 798.26 from HEPPP (Higher Education Participation and Partnership Program, 2014. Project 2: ‘Corporate social responsibility communication strategies in small and medium sized enterprises in the Asia-Pacific region’ (Dr Sujana Adapa) – secured $13 385 from URS (University Research Seed Grant), 2013. Project 3: ‘SaferGate and work place safety’ (Dr Philip Thomas & Dr Sujana Adapa) – secured $30 000 from the NSW Work Place Health and Safety, 2012. Project 4: ‘Social network analysis and innovation climate’ (Dr Philip Thomas & Dr Sujana Adapa) – secured $3500 from the Department of Family and Community Services, 2012. Project 5: ‘Regional innovation: Strategic development community based innovation in the Northern Inland region of NSW’ (Dr Philip Thomas, Professor Ted Alter (Penn State), Dr Michael Fortunato (Penn State), Dr Sujana Adapa & Ms Elizabeth Davies) – secured$100 000 from Enterprising Regions Program funded by NSW Trade and Investment, 2011. Project 6: ‘Investigating rhetoric and realities of the concept of corporate social responsibility in small and medium sized accountancy firms in regional Australia’ (Dr Sujana Adapa & Dr Jennifer Rindfleish) – secured $8294 from NIA (National Institute of Accountants) / BEPP (School of Business, Economics and Public Policy, UNE) Joint Research Program, 2010. Project 7: ‘Exploring the importance of personal selling skills for accountants in small and medium sized accountancy firms in Tamworth and Armidale’ (Dr Jennifer Rindfleish & Dr Sujana Adapa) – secured $11,381 from NIA (National Institute of Accountants) / BEPP (School of Business, Economics and Public Policy, UNE) Joint Research Program, 2010. Valenzuela, F., Fisher, J., Whale, S., & Adapa, S. (2013). Developing and Evaluating Social Presence in the Online Learning Environment. International Proceedings of Economic Development and Research Journal, 60, 95-101. Thomas, P., Adapa, S., Davies, E., Fortunato, M., & Alter, T. (2011). Intentional Innovation Communities: Strengthening Innovation Performance in the Northern Inland Region of NSW. Extension Farming Systems Journal, 7(2), 126-128. Adapa, S. (2008). Discriminant Analysis of Adopters and Non-adopters of Global Brands: Empirical Evidence from India and Malaysia. The ICFAI University Journal of Brand Management, 5(4), 7-25. Adapa, S., & Sheridan, A. (2016). Women, Accounting and the Difficulties of Forging an Entrepreneurial Identity in India. In P. Kumar, It’s My Business (forthcoming). Palgrave: McMillan. Adapa, S. (2015). Small and Medium-sized Regional Accounting Firms: Information and Communication Technologies. In B. Kotey, SEAANZ Book Series 136-153. Australia: Tilde University Press. Adapa, S., and Valenzuela, F. R. (2013). Case Study on Customer’s Ambidextrous Nature of Trust in Internet Banking: Australian Context. In V. Jham, & S. Puri (Eds. ), Cases on Customer-Centric Marketing Management , IGI Global, Business Science Reference 206-229. New York: Hershey. Adapa, S. (2013). Electronic Retailing of Prepared Food in Australia. In K. Tarnay, S. Imre. & L. Xu (Eds. ), Research and Development in E-Business through Service-Oriented Solutions, IGI Global, Business Science Reference, 280-292. New York: Hershey. Adapa, S. (2013). eServices Efficiency of Government Organisations in Asia. In Z. Mahmood (Ed. ), E-Government Implementation and Practice in Developing Countries Developing E-Government Projects: Frameworks and Methodologies, Business Science Reference, 323-340. New York: Hershey. Adapa, S. (2013). Technology Advancements Usage: Demographic Variations. In V.C. Bryan, & V.C.X. Wang (Eds. ), Technology Use and Research Approaches for Community Education and Professional Development, Business Science Reference, 274-293. New York: Hershey. Adapa, S. (2013). Government ICT Adoption – Global Trends, Drivers and Barriers. In S. Saeed, & C.G. Reddick (Eds. ), Human Centered System Design for E-Governments, IGI Global, Business Science Reference, 1-14. New York: Hershey. Adapa, S. (2011). Global Ebanking Trends: Evolution, Challenges and Opportunities. In E-Banking and Emerging Multidisciplinary Processes: Social, Economical and Organizational Model (Ed), IGI Global, Business Science Reference, 1-8. New York: Hershey. Thomas, P., Adapa, S., and King, B. (2013). Preliminary Investigation of Innovation Landscape to determine and realise Collaborative Potential in Complex Work Environments. For the Department of Family and Community Services (FACS). Adapa, S., & Thomas, P. (2013). Safe Cattle Handling Practices. NSW Workplace Health and Safety. Thomas, P., Fortunato, M., Adapa, S., Davies, E., and Alter, T. (2012). Intentional Innovation Communities: Strengthening Innovation Performance in the Northern Inland Region of New South Wales (NSW). For the Department of Industry and Investment, NSW. Adapa, S. (2012). Circumstances Probing Internet Banking Users to Use Alternative Channels: Thematic Matrix Display Analysis. Information Management and Business Review, 4(12), 606-614. ISSN 2220-4044. Adapa, S., & Rindfleish, J. (2012). Corporate Social Responsibility in Small and medium Sized Accountancy Firms. International Journal of Humanities and Management Sciences (IJHMS), 1(1), 116-120. ISSN 2320-4044. Adapa, S. (2015). “AirAsia’s Strategic Decisions – Short Haul versus Long Haul Services” In Walker, O.C., Gountas, J. I., Mavondo, F. T. & Mullins, J. W. Marketing Strategy: A Decision-Focused Approach (3rd Ed), McGraw-Hill, Australia. Adapa, S. (2014). “Islamic Financial Institutions: The Role of Culture and Subculture” In Ling, P., D’Alessandro & Winzar, H. Consumer Behaviour in Action, Oxford University Press, Australia. Adapa, S. & Valenzuela, F. (2013). “Wallsend Community Nursery: Strategies for achieving a Competitive Advantage in the Nursery and Garden Industry” In Kotler, P., Burton, S., Brown, L. & Armstrong, G. Marketing (9th Ed), 110. Adapa, S. 2014, “Career Progression of Women in Accounting Firms”, 3rd-5th December, 28th ANZAM, Sydney, Australia. Adapa. S. 2014, “Corporate Social Responsibility Activities and Practices in Small and Medium Sized Accounting Firms in Australia and Malaysia”, 27th Annual SEAANZ Conference, 14th – 18th July, Sydney, Australia. Adapa, S. & Hathaway, T. 2014, “Inter Cultural Sensitivity Training Toolkit: Augmenting Academic Engagement Patterns”, HERDSA Conference, 8th – 10th July, Hong Kong. Adapa, S. 2014, “Corporate Social Responsibility Activities in Australian Small and Medium Sized Accountancy Firms”, Institute of Research of Business and Management, Global Research Conference GRC 2014, 14th – 16th January, Goa, India. Adapa, S. 2013, “Corporate Social Responsibility in Malaysian Banks offering Islamic banking”, GCAR-EABM Conference, 14th-15th December, Kuala Lumpur, Malaysia. Rindfleish, J. & Adapa, S. 2013, “Exploring the importance of personal selling skills to practicing accountants in regional SMEs in north-west, NSW, Australia, 1st-3rd December, ANZMAC, Auckland, New Zealand. Adapa, S. 2013, “Corporate Social Responsibility: Small and Medium Sized Accountancy Firms in Malaysia”, World Business and Social Science Research Conference, 24th -25th October, Bangkok, Thailand. Adapa, S. & Laukkanen, T. 2013, “Heritage Destination Revisitation: Malaysian Perspective”, World Business and Social Science Research Conference, 24th-25th October, Bangkok, Thailand. Adapa, S. 2012, “Circumstances Probing Internet Banking Users to Use Alternative Channels: Thematic Matrix Display Analysis”, 2nd International Conference on Education and Information Management (ICEIM – 2012), 22nd – 23rd December, Penang, Malaysia. Adapa, S. & Rindfleish, J, 2012, “Corporate Social Responsibility in Small and Medium Sized Accountancy Firms”, International Conference on Business, Finance and Economics, 29th – 30th December, Kuala Lumpur, Malaysia (received the Best Paper Award). Adapa, S. and Rindfleish, J. 2011, “The Concept of Corporate Social Responsibility in Small and Medium Sized Regional Accountancy Firms”, ANZMAC Conference, 28th – 30th November, Perth, Western Australia, Australia. Thomas, P., Adapa, S., Davies, E., Fortunato, M. and Alter, T. 2011, “Intentional Innovation Communities: Strengthening Innovation Performance in the northern Inland Region of NSW”, Australasian Pacific Extension Network National Forum, 28th – 30th November, University of New England, Armidale, Australia. Adapa, S. 2011, “Corporate Social Responsibility in Universities: A Cross-Cultural Perspective”, University Learning and Teaching Futures Colloquium, 14th – 15th September, Armidale, Australia. Adapa, S. 2010, “Macro and Micro Thematic Categories Hindering Customer Adoption of Internet Banking in Australian Context”, ANZMAC Conference, 29th November – 1st December, Christchurch, New Zealand. Adapa, S. 2010, “Identification of the Factor Components Influencing the Continued Use of Internet Banking by Australian Consumers”, ANZMAC Conference, 29th November – 1st December, Christchurch, New Zealand. Adapa, S., Rindfleish, J., Cooksey, R. and Valenzuela, F. 2009, “Antecedents to Continued Usage of Internet Banking: Empirical Evidence from Australian Consumers”, UNE Postgraduate Research Conference, 13th -17th July, Armidale, Australia. Adapa, S., Rindfleish, J., Cooksey, R. and Valenzuela, F. 2009, “An Empirical Investigation of Frequency of Internet Banking Usage by Australian Consumers”, ANZMAC Conference, 30th November – 2nd December, Melbourne, Australia. Adapa, S., Rindfleish, J., Cooksey, R. and Valenzuela, F. 2009, “Consumers’ Continued Usage of Internet Banking: Australian Context”, ANZMAC Conference, 30th November – 2nd December, Melbourne, Australia. Adapa, S., Rindfleish, J., Cooksey, R. and Valenzuela, F. 2009, “Dimensions Affecting Consumers’ Continued Usage and Frequency of Usage of Internet Banking: Empirical Evidence from Australia”, GABERIC Conference, 28th – 30th December, Kuala Lumpur, Malaysia. Adapa, S. 2008, “Antecedents to Adoption of Global Brands: Empirical Evidence from India and Malaysia”, PBFEAM 2008 Conference, 3rd - 4th July, Brisbane, Australia. Adapa, S. 2008, “Consumer’s Evaluation of Electronic Banking Service Delivery Channels and Impact on Banking Provider”, UNE Postgraduate Research Conference, 15th -18th July, Armidale, Australia. Adapa, S. 2008, “Customer Perceived Value of Internet Banking in Australian Context: A Conceptual Model Development”, ANZMAC Conference, 1st - 3rd December, Sydney, Australia. Adapa, S. 2008, “Factors Hindering the Heritage Destination Promotion in Malaysian Context”, ANZMAC Conference, 1st - 3rd December, Sydney, Australia. Adapa, S. and Rindfleish, J. 2007, “Measuring the Outcomes of Sales force: Does Training Really Pay-Off”, INFORMS Marketing Science Conference, 26th - 29th June, Singapore. Adapa, S. and Rindfleish, J. 2007, “Adoption of Internet Purchase of Products and Services by Indian Women Residing Globally”, CISTM Conference, 16th – 19th July, Hyderabad, India. Adapa, S. and Rindfleish, J. 2007, “Heritage Destination Promotion: Indian Expatriates in Kuala Lumpur”, 2nd International Conference on Tourism and Hospitality Management, 30th July - 2nd August, Kuala Lumpur, Malaysia. Adapa, S. and Rindfleish, J. 2007, “Internet Shopping: Cultural Considerations in India and Australia”, ANZAM Conference, 4th – 7th December, Sydney, Australia.